For mother's day this year I made my grandma floppy hat that wasn't made from cotton but from soft yarn. Using size J -make a magic circle and use a yarn marker. 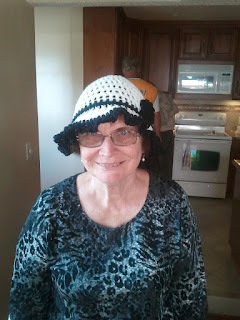 Very nice photo and nice hat pattern thank you for sharing, I'll be sure to try this one out. I'd love to make this for a baby. Any idea how to change the size? Thanks! I made 2. One black and pink and black and white. I love this hat. Thank you. Ami... i do! Do you?